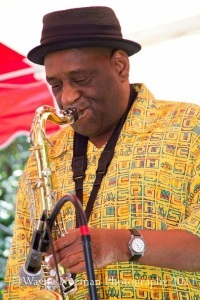 We are sad to report the death of noted jazz saxman and flutist, Allan Barnes, at age 67. Discovered by renowned musician Donald Byrd, Barnes became part of the legendary group the Blackbyrds while still a student at Howard University. And the Detroit born and reared musician went on to great success with the band, including playing on the smash hit "Walking in Rhythm." Barnes became a much sought after studio musician in the 70s and 80s, and played with such notable figures as Bootsy Collins, Martha Reeves, Pharoah Sanders, Lakeside and even Prince. He also spent time working with his own band, Primetime. More recently, Barnes co-wrote "Money Makes the World Go Round" with R. Kelly and had a small role in the hit movie Bird. Barnes' catalog of work was a favorite of young artists, and he performed on both R&B and hip-hop recordings well into the 2000s. His final notable recording was with a number of Detroit hip-hop artists in a musical tribute to J Dilla. He continued to perform right into 2016. Allan Barnes was another musical giant gone too soon. He will be greatly missed.